The Government and Public Service Society, the Duke Criminal Law Society, and the Duke Law National Lawyers Guild won awards given to student organizations, while Amanda Ng ’20, Tanya Smith ’19, and Chris DiNardo ’19 won awards recognizing individual leadership and service. The D.O.N.E Awards, presented by the Duke Bar Association, recognize student organizations, student leaders, and faculty who make significant contributions to the community and academic experience at Duke Law. Nominations and feedback are solicited from the entire student body, and winners are finalized by a committee of students representing the classes of 2019, 2020, and 2021. The Distinguished Teaching Award, which is accompanied by a stipend supported by the Class of 1967, has been given annually since 1985. Recipients serve as faculty hooders at the Law School’s graduation ceremony in the year that they won and the year after. Jones, who joined the Duke Law faculty in 1995 after working as a commercial litigator in Washington, D.C., teaches Civil Procedure, Employment Discrimination, Race and the Law, and Critical Race Theory. From 2008 to 2011, she served as a founding member of the faculty at the University of California, Irvine, School of Law, where she created and directed the Center on Law, Equality and Race. 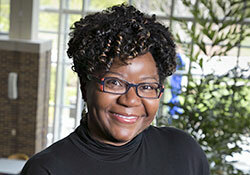 She focuses her research and writing on racial and socioeconomic inequality. Students who nominated Jones for the award praised both her teaching style and her willingness to provide mentorship and help. “[Jones] garners a level of trust and respect in her classroom that I have never experienced before,” wrote one student. “She cultivates authentic and real conversations that engage the material and also look forward to solutions. She always reminds us of our role as future lawyers and law shapers, allowing us to reflect on our world and our role within that world. Jones said that teaching had never been her ambition, and that when she entered the profession, she drew on the influence and inspiration of three of her own professors at Cornell University and the University of Michigan School of Law to help her “figure out what the heck I was doing and how I wanted to do it.” She noted that her students have also taught her a great deal, challenging her and broadening her perspective. The Government and Public Service Society won the Greatest Role in Building Relationships Award, which identifies the student organization that took the extra step in reaching out not only to students, but to guest lecturers, practitioners, and Duke alumni. The group was praised for organizing small group lunches for students and professors, forging connections with practitioners through its events, and launching an alumni mentoring program. The Duke Criminal Law Society won the Outstanding Contribution to Civic Discourse Award, which recognizes the Duke Law organization that made the biggest impact on providing a forum for engaged civil dialogue for students and professors alike. The group’s programming highlighted issues of particular interest in North Carolina and “brought together criminal lawyers and criminal justice advocates throughout the state,” one student wrote. Ng won the Outstanding Student Organization Leader Award, which goes to a student who has found time to take on one or multiple leadership roles within the community, and to make a difference in those positions. Ng, who was recognized for her role as president of the Government and Public Service Society, has “poured her heart and soul into making her student organization on of the more well known and impactful groups on campus,” one nominator wrote. DiNardo won the Richard Lin Award, which honors the memory of a member of the Class of 2016, recognizes character and actions that reach across the Law School community, without a leadership position or title. Students cited his coordination of community service events, leadership of ad-hoc seminars, and mentorship of 1Ls and 2Ls, “including taking personal time to do mock interviews for public defense positions.